AHEPA was founded on July 26, 1922 in response to the evils of bigotry and racism that emerged in early 20th century American society. It also helped Greek immigrants assimilate into society. Today, AHEPA brings the ideals of ancient Greece, which includes philanthropy, education, civic responsibility, and family and individual excellence to the community. Although a majority of the membership is composed of Americans of Greek descent, application for membership is open to anyone who believes in the mission of the organization. AHEPA is a 501(c)(3) non-profit organization. The mission of the AHEPA Family is to promote Hellenism, Education, Philanthropy, Civic Responsibility, and Family and Individual Excellence. Hellenism An important component of AHEPA's mission is to create an awareness of the principles of Hellenism to society. These principles include a commitment to humanity, freedom, and democracy. The preservation and promotion of these ideals is where AHEPA has, and always will be, deeply committed. AHEPA educates the community on these matters through symposia, forums, and conferences. Education AHEPA's commitment to education has been well documented throughout its history. Over $4 million is endowed at the local, district and national levels toward the use of scholarships and a half-million dollars is awarded annually. Thousands of young men and women have benefited as recipients of AHEPA scholarships at these various levels. The most famous recipient, perhaps, is ABC News' Host of This Week George Stephanopoulos. The scholarship program at the national level is administered by the AHEPA National Educational Foundation. It offers scholarships to a wide variety of students. Recipients are: traditional and non-traditional students; seminarians, including those entering Holy Cross Greek School of Theology; and high school seniors, college and post-graduate students who are looking to become tomorrow's leaders. The preservation of Hellenic or Classical Studies programs on college campuses is an important issue for the AHEPA Educational Foundation. A subcommittee of the Foundation, the Hellenic Cultural Commission, actively works to support the study of the Classics at universities. In addition, educational programs such as "Journey to Greece" and Washington Internships are sponsored by the Foundation. Philanthropy Philanthropy and volunteer-ism have been pillars of strength for AHEPA. From natural disaster relief to raising funds for the elimination of life-threatening diseases to making significant contributions to our local neighborhoods, AHEPA is at the forefront of charitable giving. AHEPA's philanthropic deeds are evident in the restoration of the Statue of Liberty and Ellis Island; in the Halls of St. Basil Academy, a childcare facility in Garrison, N.Y.; in the care packages we sent to our troops in cooperation with the USO; and in the building of healthcare facilities in Greece. Yet this only scratches the surface of the numerous philanthropic works of the association. In addition, countless charitable projects are undertaken every year by AHEPA's chapters and districts. Civic Responsibility Our grassroots has a strong voice. With chapters in every major metropolitan city and in rural areas of North America, AHEPA communicates the positions of the Greek-American community to elected representatives at the federal, state, and local levels, as well as to our diplomatic leaders. These issues pertain to Greece, Cyprus, and Turkey; however, our constituents are also interested in domestic policy areas affecting the philanthropic, civic, and community service-based programs in which they are involved. These positions are based upon our American heritage and ideals with the best interest of the United States in mind. AHEPA educates its constituents about these issues through seminars and conferences, providing expert panelists from the U.S. government, prominent Washington, DC Think-Tank organizations, and the business world. Furthermore, AHEPA keeps a watchful eye on Congress with its Congressional Scorecard, a tool that evaluates each member of Congress on Greek-American issues. The Sons of Pericles was established February 3, 1926, and was officially recognized as the Junior Order of AHEPA in 1928. Finally, the Maids of Athena was founded July 5, 1930 as the Junior Women's Auxiliary of AHEPA. The two youth groups have combined to contribute to such worthy causes as: Muscular Dystrophy, Deborah Heart and Lung Foundation, the Special Olympics, St. Basil Academy and Cooley's Anemia research. The Ideals of Ancient Greece Important to All AHEPA members are proud of the contributions the ancient Greeks gifted to Western Civilization. As Americans, we share many of the values put forth by them: civic responsibility, philanthropy, education, family and individual excellence, and the ideals of democracy. This is the essence of our heritage. This is the core of our mission. Moreover, throughout the span of its history, AHEPA has served as a vital vehicle for the progressive development and emergence of American citizens of Greek heritage into every facet of society: government, business, education, and the arts. This fulfillment illustrates the promise of the American Dream and symbolizes the hard work ethic of our immigrant for-bearers who labored to achieve that dream with the principles of Hellenism rooted deep in their hearts. It was 1922, Americans of Hellenic heritage were suffering personal and economic intimidation orchestrated by the revived Ku Klux Klan. It was time for them to unify and organize, to protect and defend life and livelihood. The widespread and often violent discrimination against immigrants from Greece is an almost forgotten page of American history. This is probably because of their subsequent success and the great accomplishments of their descendants. Very fewpersons today, Hellenic or not, are even vaguely aware of the massive continental strength of the Klan of the 1920s and its intensive persecution of foreign-born Greeks, including those who had chosen to become American citizens. They do not know how deeply the evil shadows of bigotry, hatred and intolerance cast their malignant darkness over North America. Perhaps it is time to remind them. The newly-reorganized KKK rampaged against frightened immigrants and helpless minorities throughout the U.S. It dominated politics in states in both the North and South. In Canada, its dangerous wicked ways were transplanted and flourished, especially in the western provinces. An estimated three million militant hooded Klansmen stalked across our continent, burning crosses and spawning terror. During its reign of power, the Klan elected sixteen U.S. Senators, eleven Governors and an undetermined large number of Congressmen, both Republican and Democrat. It reportedly exerted considerable influence in the White House. Klan organizations ruled local politics in the major cities of Dallas, Denver, Indianapolis and Portland, Oregon, as well as in such smaller communities as Anaheim, California; El Paso, Texas; Youngstown, Ohio and Portland, Maine. In 1922, California and Oregon voters elected Klan-endorsed gubernatorial candidates. Then in 1924, a Klan candidate won the governorship in Kansas. The same year, the Klan endorsed U.S. Senate winners in Alabama, Colorado, Georgia, Indiana, Oklahoma and Texas. It also won the gubernatorial contests in five of these six states, barely losing in Texas. THEN--the Ku Klux won't be worth a damn. 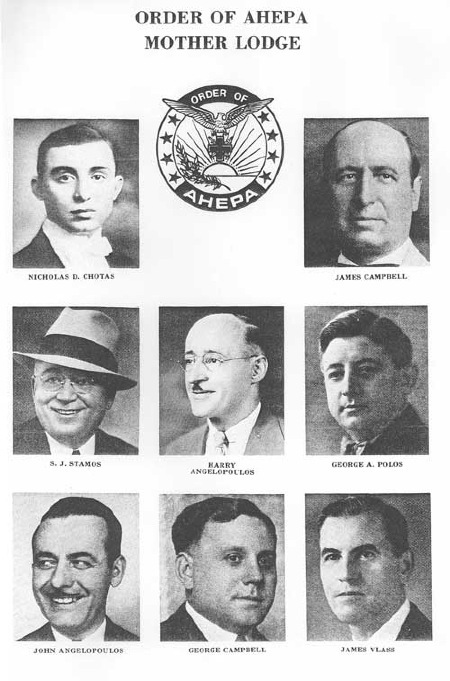 Meanshile, embattled but visionary Greek immigrant leaders met on July 26, 1922, in Atlanta to form the American Hellenic Educational Progressive Association, now better known as the Order of Ahepa. Not by coincidence, Atlanta was the home of the national Imperial Headquarters of the Klan. The most important goal of the Ahepa founders was to quickly and solidly establish better relations with non-Greeks. They agreed to do this by taking the positive high road of reason emphasizing assimilation, cooperation, persuasion and unlike their marked foes, non-violence. Their main discussion was how to best contain the wave of hostility which had almost drowned them. The ominous specters of twisted Americanism and KKK aggression spurred them to create a patriotic fraternal order espousing undivided loyalty to the United States. American citizenship, proficiency in English, active participation in the civic mainstream, economic stability, social unity and the pursuit of education. The latter was considered vital for its obvious gifts of knowledge and as the essential key to upward mobility. The Ahepa founders were profoundly disturbed and alarmed by their bitter experiences with Klan prejudice and by reports of worse bigotry elsewhere. Even before the Klan reappeared, there had been senseless attacks on foreign-born Greeks, some fatal. However, the new Klan expertly and abrasively honed intolerance with brutal efficiency to silence and subdue all of its alleged inferiors. Many Greek-owned confectioneries and restaurants failed financially or were sold at sacrificial prices to non-Greeks because of boycotts instigated by the Klan. Greek establishments doing as much as $500 to $1,000 a day business, especially in the South and Midwest, dropped to as little as $25 a day. The only recourse was to sell or close. The Klan often bolstered its boycotts by openly threatening or attacking customers entering and leaving. A Klan Imperial Lecturer told Klansmen in Spokane that Mexicans and Greeks should be sent back to where they came from so that white supremacy and the purity of Americans be preserved. Meanwhile, in Palatka, Florida, a Greek immigrant was flogged for dating a `white' woman. The Royal Riders of the Red Robe was a Klan affiliate assembled `as a real patriotic organization' for approved naturalized citizens unluckily born outside the United States. However, in the ultimate snub of exclusion, immigrants from Greece, Italy and the Balkans were not eligible to join. In Indiana, the state most politically controlled by the 1920s Klan, burning crosses were ignited in the yards of outspoken Hellenes. Unprovoked beatings of Greeks were not reported to police lest another beating soon follow. Others were warned of dire consequences if they spoke Greek in public, even in their own business establishments. Today, according to sociologist Charles C. Moskos, Jr., of Northwestern University, American Hellenes proudly rank first among all ethnic groups in individual educational attainment and second in individual educational attainment and second in individual wealth. They have succeeded in every facet of American life. The Order of Ahepa has played the prime historic role in this ascent. True to its original mission, Ahepa financially supports scholarships, educational chairs, housing for the elderly, medical research, community programs, charitable projects and other worthy endeavors through contributions of more than two million dollars a year from its chapter, district and national levels. Ahepa validated its patriotic roots during World War II by selling over five hundred million dollars of U.S. War Bonds, more than any organization in America. Meanwhile, Ahepa officials first visited the White House to meet with President Calvin Coolidge in 1924 and have conferred with all twelve Presidents since Presidents Franklin Roosevelt, Harry Truman and Gerald Ford became Ahepa members. Ahepa moved its headquarters to Washington DC in 1924 and later expanded its scope by adding three auxiliaries to complete the Ahepa Family: the Daughters of Penelope for women, the Sons of Pericles for young men and the Maids of Athena for young women. Its combined eight hundred chapters, consisting of about 35,000 members, cover the United States and Canada and have planted successful units in Australia and Greece. It held its 75th annual convention in Atlanta in August. In 1990, Ahepa filed an amicus curiae (friend of the court) brief in the Georgia Supreme Court. It backed the legal position of the National Association for the Advancement of Colored People (NAACP) and the Anti-Defamation League (ADL) of B'nai B'rith in support of a state law banning masks in public which was challenged by the KKK. The court ruled 6 to 1 to uphold the constitutionality of the anti-mask statute. The significance of the favorable decision to a jubilant Ahepa was that it came in the city of its founding and helped seal the doom of another failed Klan revival. Moreover, it enabled Hellenes to join in victorious celebration with fellow black and Jewish Americans whose forbearers also were sadistically harmed physically, mentally and economically by the KKK of yesteryear. Along with Roman Catholics, Asians and other immigrants considered unacceptable by the Klan, they were targeted separately and together then because they did not fit the rigidly narrow KKK concept of what constitutes a good and loyal American. For Hellenes, it is supremely ironic that the six organizers of the original Klan in 1865 created the words Ku Klux from kuklos, a variation of the Greek kyklos meaning cycle or circle, and applied it to their own little circle. Today the 1920s version of the KKK is long gone--and its flickering reincarnations are virtual nonentities. The Klan deserved to die--and died. The Order of Ahepa thrives three quarters of a century after its historic birth amid the fiery heat of hate--generated by the toxic Klan cauldron of insane fanaticism. Ahepa deserves to live--and lives.